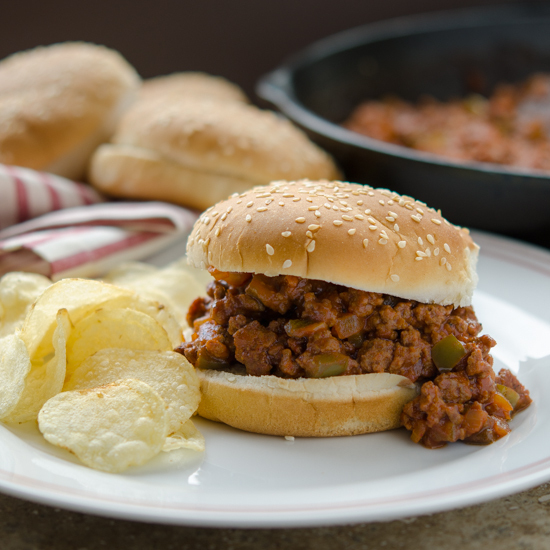 Sloppy Joes is one of the well known American classic dish. I understand the term “sloppy” in the title. This is a kind of dish that can be prepared quick and easy, and it can be a little messy when you eat with hands. However why does it have a name of “Joe”? Why not Bob or David? Just simply curious! Anyway, I want to give a little twist to this all American classic sandwich by adding a Korean flavor. 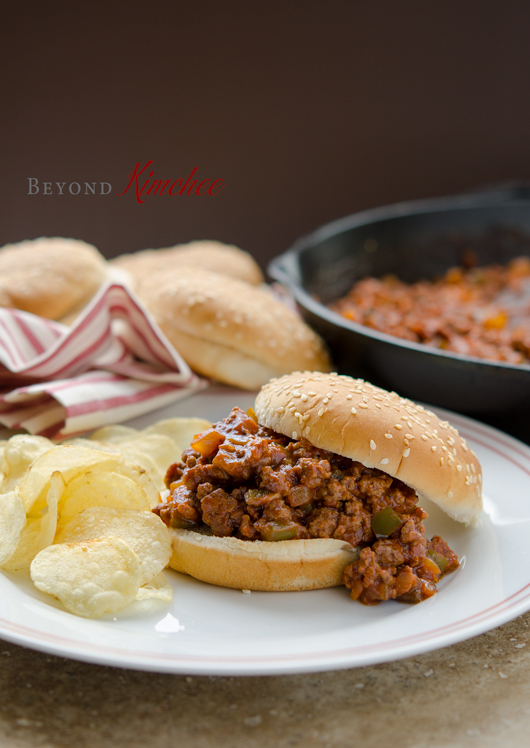 Yes, this is Gochujang Sloppy Joes! Gochujang will add a very gentle spicy kick and you will love how it binds all the flavors so nicely. I made this recipe for JayOne and you will find the same recipe on their site as well. 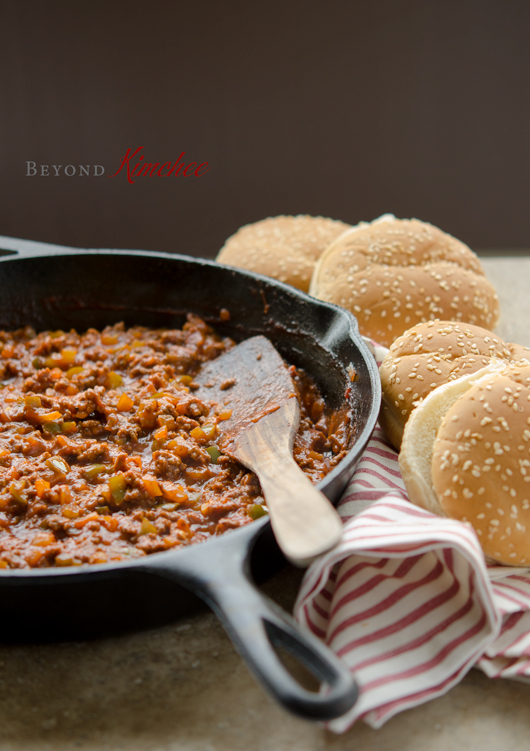 If you are stuck with ideas of what to make for dinner, try this Korean fusion of Gochujang sloppy Joes to add a little variation on your repertoire. You never know! This might become your routine. 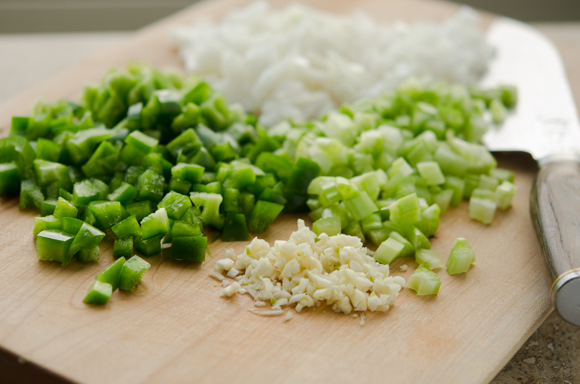 The holy trinity of American vegetables, the onion, celery, and green pepper. A couple of garlic joined to be part of the divine mission. Saute them in a little oil until soft, about 3 minutes. 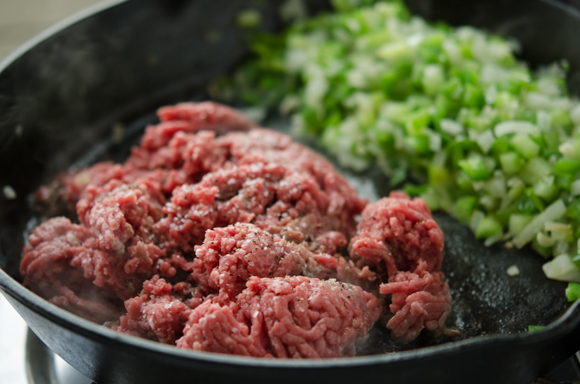 Push the vegetables to one corner of the skillet and add the ground beef, seasoning with salt and pepper lightly. Cook until they are browned. Add gochujang and all the rest of the everyday ingredients in your kitchen! 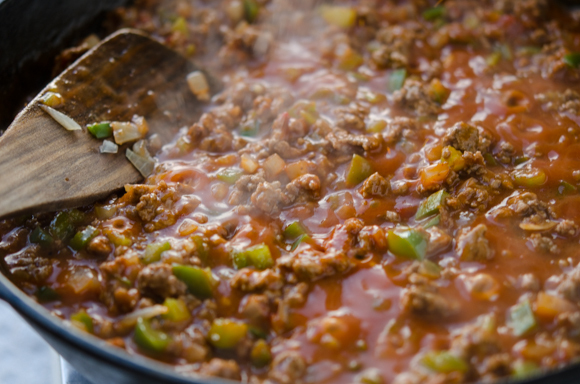 and simmer for 15-20 minutes so that the sauce gets thicken and all the flavor will mingle with each other. Yum! The flavor is just awesome! My kids loved it! This is my *Korea meets America* version of a simple weeknight dinner. Pile high over your hamburger bun and dig in! A slice of cheese would add nice touch, too. You will eventually need a folk and some napkins to finish it up, though. Because…, after all, it is SLOPPY!! Sorry, Joe! 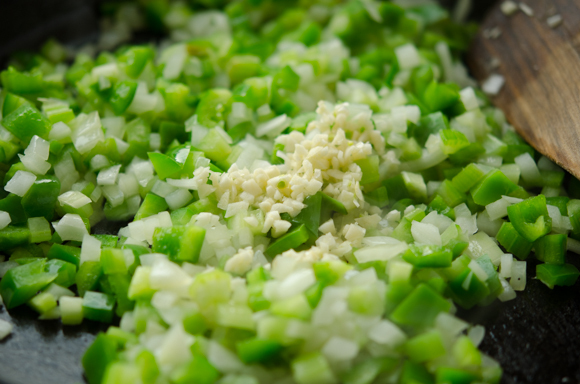 Chop the onion, green pepper, celery, and garlic. Heat 1 tablespoon of oil in a skillet over medium heat, then add the Holy Trinity of vegetables - onion, green pepper and celery. Saute them until slightly soft, about 3 minutes. Add garlic and continue to cook 1 more minute. Slide the vegetables to one side of the skillet. 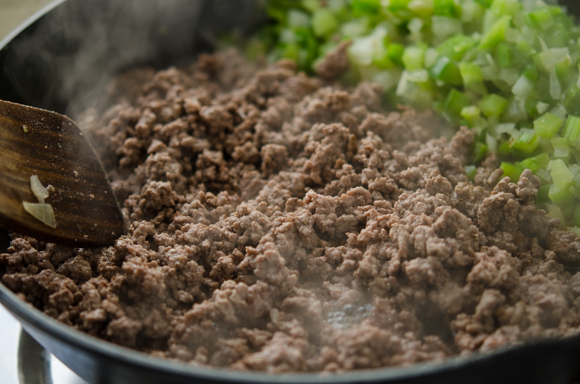 Drizzle the remaining oil onto the skillet and add the ground beef. Sprinkle a little salt and pepper on top and let the beef sizzle for 1 minute. Stir the beef to brown thoroughly. When the beef is cooked mix with vegetables. Add tomato sauce, ketchup, mustard, brown sugar and cider vinegar. Stir well and bring to gentle boil. 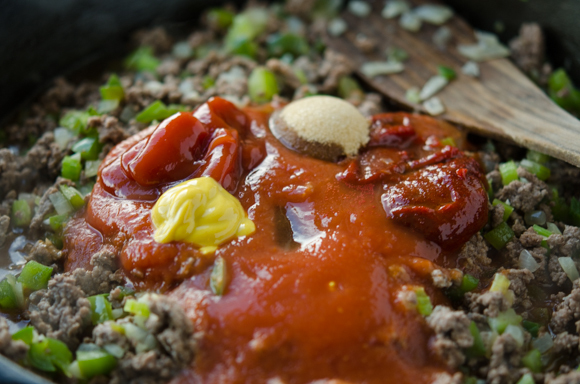 Reduce the heat to low and let the whole thing simmer for 20-25 minutes, uncovered. 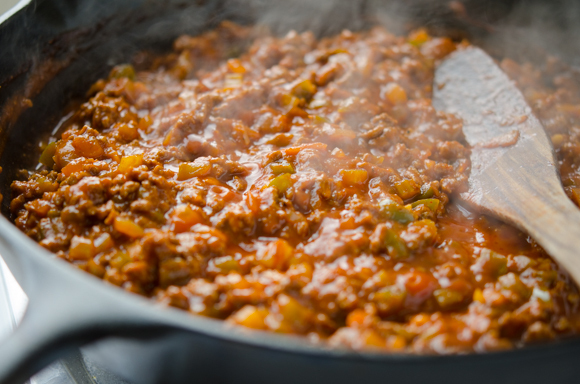 The sauce will thicken as it simmers but should be moist without being dry. Adjust the heat accordingly. 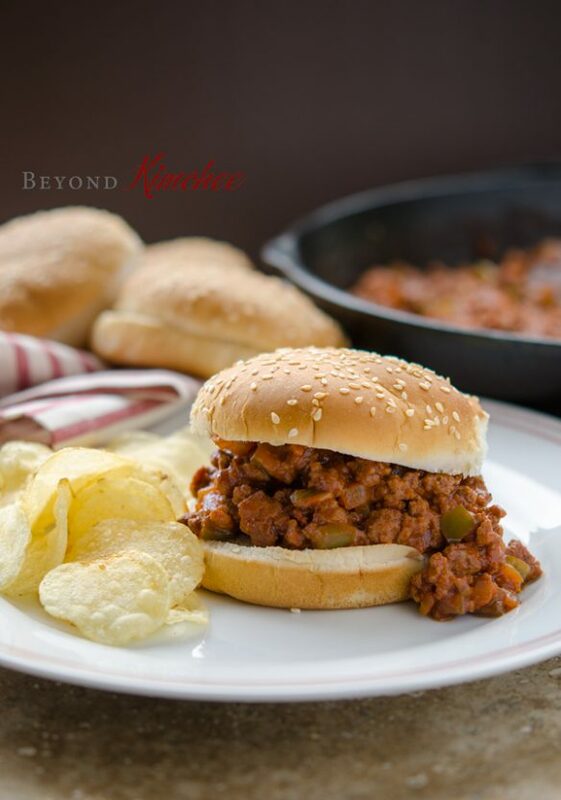 Serve these mouth-watering Sloppy Joes over hamburger buns and savor the East-meets-West version of an all-American classic every single bite. Enjoy! Hi Jeanne Thanks always for your support. I love trying Korean ingredient in western dishes. This was quite nice and my whole family loved it. Hope you can give it a try soon! Neat idea! This looks like a great way to revitalize this classic family dinner. Thanks Mary. It is always fun to add a little twist on the classic, right? I haven't made Sloppy Joe's in ages! And I've always wondered how the dish got its name. ;-) Love the bit of heat in this -- very nice. Thanks for this. I don't make sloppy Joes often either. It was fun to add ordinary ingredient to see how it will taste, and it was successful for me. I tried this today for lunch, quite good. It also makes an interesting dip for corn chips! Sounds like a perfect dip for the chips! Glad to hear you enjoyed, Chris! I love adding gochujang to everything! We Koreans like things hot and spicy! This summer, I'm making these and I'm sure everyone's gonna love them! Thanks Joseph. I love gochujang and it brings very nice flavor to this dish. thank you! perfect timing (in me reading your post). Last night I made hamburgers, but it's just my son and I, so I only used half of the package of ground meat. Now I know what I'm doing with the other half! 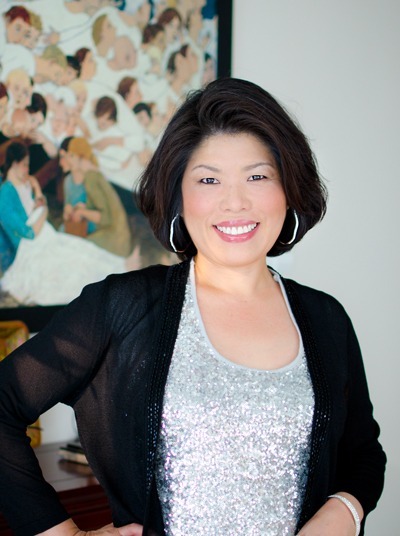 I just love your blog, always new and interesting ideas. I've never been to Korea and only once had the chance to even visit a Korean restaurant (I think there is only one in the whole country of Finland), but this blog means I get to try a lot of new, interesting tastes. These I will eat soon. Like, really soon. 5-minutes-from-now soon, when the sauce is done. Yum! Hi Ulverinna I am happy to hear that your are trying this recipe. Hope you like it. Holly- I made this yesterday for my husband and children and the first words my husband said after the first bite was "You have to make these everyday!" I absolutely love this recipe! Thank you so very much for sharing! Hi Kayla SO happy to hear that your family loved this recipe. It is so tasty to add Korean gochujang to American classic, and my family loves it very much, too. Howdy Holly! I stumbled upon this recipe last week. I made the sloppy joes for dinner one night, and a few days later, I used the leftovers to make tostadas with a little sriracha/mayo swirl on top. My family totally loved both meals! Thank you for sharing this recipe! You rock! This is so good! I garnished mine with chopped kimchi, pickled veggies and cilantro. Why not? Yeah! 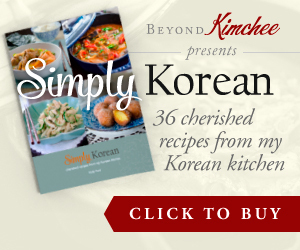 I like the addition of chopped kimchi and pickled veggies idea! Why didn't I think about it? Glad that you liked it. Delicious and super quick. Before making this, I hadn't had a sloppy joe in years, but I don't recall them tasting quite this good. You are right, the gochujang rounds out the flavour. This sloppy joe would go well with your apple coleslaw. Thank you for the recipe.